Can I just gush for a minute? It’s a badly kept secret that I’m a huge auto racing fan. It probably started with the NASCAR Sprint Cup series (though it was the former Winston Cup series when we began our love affair) but it’s progressed to Nationwide, Craftsman Trucks, Indy Car, drag racing in all forms, and F1 just to name a few. Seriously. So imagine my level of giddy when I got an invite to attend the media open house at the Myrtle Beach Speedway today. The speedway was recently sold and with the new owner came his company, the NASCAR Racing Experience. Though I learned today that the original order was reversed. The initial intention of Bob Lutz, the CEO and co-owner, was just to bring the racing experience, however, with the help of Andre Bauer, former Lt. Governor of South Carolina and current candidate for our new 7th District Congressional seat, this venture turned into something much more with the purchase of the track. For more information on this whole back story, you can check out this Digitel article. Bob Lutz is the founder of the Richard Petty Driving Experience, a race school similar to the NASCAR Racing Experience. I had the opportunity, many moons ago, to do a ride-along at the Charlotte Motor Speedway and was completely geeking out at the chance to do it here. My driver was Sam Yarbrough, famous racing last name though I’m uncertain of any relation. Sam is a NASCAR Whelen driver and try as I might, I can’t find a website for him to share some link love and turn you all into his newest fans with me. The Myrtle Beach Speedway is just over half a mile with gentle banking. Charlotte is a mile and a half with 24 degrees of banking. That may not sound like a lot, but try walking up it. When you’re in a stopped vehicle at the height of it, you’re thanking God for securely fastened seat belts because you’re kind of falling out of your seat. Don’t ask me how I know, but I had to put a good amount of faith in the stability of that vehicle and the tread in its tires. The other noticeable difference is your proximity to the inside wall on the turns. Believe me when I tell you that while there is a white line, there is no apron. At all. We were inches from it and it was beyond cool. One noteworthy mention was the attentiveness of the staff. While I typically shrug off any special treatment for being a woman, I want to give a shoutout to the guys working at the track and actually with the cars. Everywhere I went, while getting over the pit wall and onto the track, and again into and out of the car, I was offered a hand of assistance and kind coaching. It’s a joke, but one based on truth. Getting out of the car through the window feels a little like it’s giving birth to you. While I attempted to do it with as much style as possible, I had this very nice guy telling me where to place my hands to best achieve the goal. Also, this same guy, while buckling me in was gentle, conscious of fact that he was manuevering all around the front side of my body, and extremely respectful. I felt taken care of, despite being totally willing to be treated like a guy taking on the same task of getting on to pit lane, in a race car, strapped in, unstrapped, and back out. It was nice and appreciated. So what does all of this mean? Let me boil it down for you. 1. 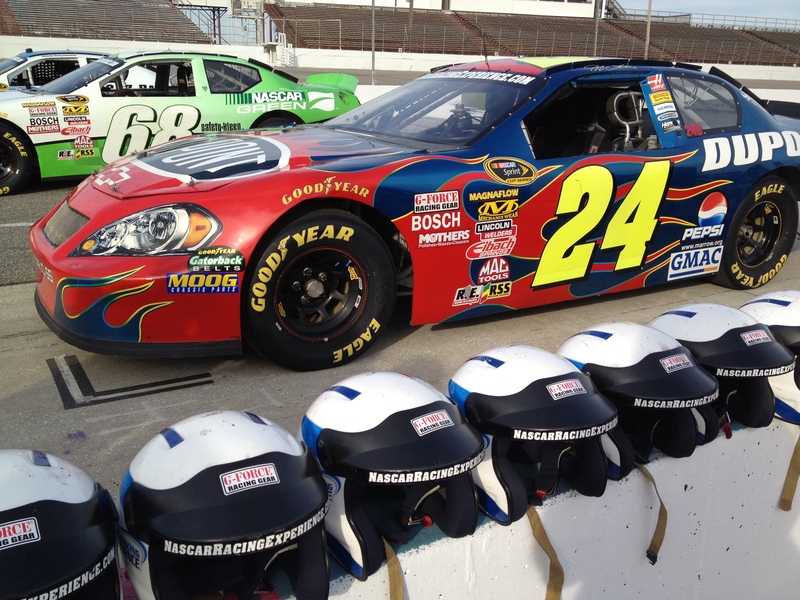 The NASCAR Racing Experience is a new tourist attraction in our area. They will run several days a week. You can find out more about the ride-alongs and driving packages with prices here. If you’re familiar with the experience because you’ve researched or completed it at other tracks, you’ll notice that the prices are considerably lower. I love our Myrtle Beach Speedway so I shall not disrespect it, but having been to many other larger tracks, adjust your expectations. We are a local track with functional facilities, which I learned are undergoing upgrades. This is not a super speedway with lush amenities but there are no compromises when it comes to safety. 2. If you’ve done a racing experience before, this is different as there is no lead car. Your instruction comes to you before strapping in and while in the car via radio communication. 3. Speeds range from 70 to 90 mph. That’s, obviously, a little comparatively slow but it really is exciting and a challenge to do well. 4. The sale of the track and introduction of the NASCAR Racing Experience will, I believe, breathe new life into the local (and beyond) racing scene. In the bigger picture, it feels like the events at the two largest speedways in close proximity (Darlington Raceway and Rockingham Speedway) are losing dates. Darlington used to have two Sprint Cup weekends. Now we’re down to one and we lost our prestigious and historic Labor Day weekend. Rockingham lost their Cup date altogether, though it was nice to see the trucks there last weekend. Still, I’m hopeful that this strong presence the NASCAR Racing Experience brand brings will revitalize the importance of this area to the sport, solidify our current dates at Darlington and Rockingham, and hopefully expand on them and the series that run at Myrtle Beach Speedway. Ladies, if your husband is a race fan, he’ll love the experience of driving or riding as a passenger. And if you’re like me, a race fan yourself, DO IT!!! Throw away any inhibition you may have about wearing the race suit or gracefully getting in and out of the car and have fun. Heck, even if you’re not a fan you’ll have a great time. Families, while I’ll write more about this later, invest in your local racing community. Opening day at Myrtle Beach Speedway is Saturday, May 5, 2012. They’re running a special where a family of four gets in for $19.99 with freebies for kids. You can learn more about that, as well see details about admission for other events here. I’m excited, can you tell? I truly love racing. I couldn’t be more thrilled about the changes at the Myrtle Beach Speedway. I’m looking forward to the Southern 500 in Darlington in a few weeks. I know this is a huge deviation from my typical posts, but I have to ask. Who reading is a race fan and who’s your favorite driver? If you’re interested in connecting with them, the Myrtle Beach Speedway can be found on Facebook. The NASCAR Racing Experience is also on Facebook. I’m glad you had a great time, I hear there was a large crowd for todays event, I’ll be driving next Friday. Gary, you’re going to have so much fun. Are you doing the 5 or 8 minute experience? Have you ever done it before? Heard there are other manatory fees not included in ticket purchase. Purchased a ticket on rocket grab for the 5 min drive??? I hadn’t heard anything about extra fees. The only extra I know about are photos, but you are not obligated to buy them. If you find out I’m wrong definitely let me know. Thanks and have fun!